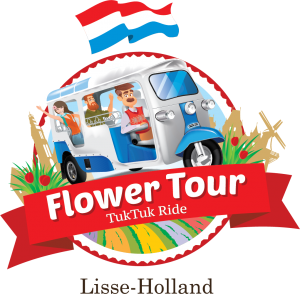 With this great TukTuk Tour you get an exclusive private tour along the flower fields around Keukenhof. Your local guide is also your driver and brings you to the most beautiful places. This TukTuk Tour leaves every day at two moments. The TukTuk tour can be booked every day in the Keukenhof season. In 2019 this is from 21 March 2019 until 19 May 2019. The Tour leaves at 10:00 and 17:00. What is included in the TukTuk Tour? 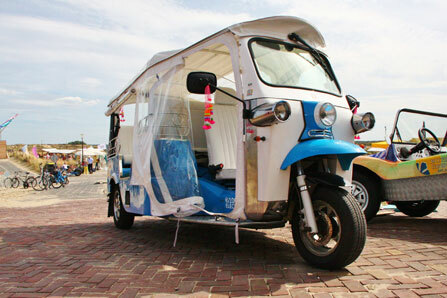 The TukTuk Tour is a great experience and a super fun part of your day out to the flowers in the Bulb Region. The TukTuk Tour is ideal to combine with a visit to Keukenhof. Optional admission ticket Keukenhof for € 18.00 p.p. The TukTuk Tour has an all-in price. This does not depend on the number of people. There is space in the TukTuk for 4 adults and 2 children (excluding the driver). Choose the start time of your TukTuk Flower Tour. you want to cycle along the flower fields in Holland? Then the Flower Tour bicycle route is the ideal way to discover the tulip fields. The flower fields are great from the ground but from the helicopter you get a completely different view of the flower region. Experience the enchanting and iconic tulip fields at their purest! Enjoy a trip through the famous FlowerBulb region with the Tulip Tour.